An image from a wedding at the wonderful Kenwood Hall in Sheffield. The Bride has just been to see the Registrar and now heads for her wedding escorted by her mum. I like this picture probably because it has some movement in it, the bride enters through the door lifting her wedding dress clear of the floor as she walks in, you can almost see the movement as she walks. Kenwood Hall is one of our favourite locations for wedding photography. The hotel itself is wonderful with a number of rooms to cater for weddings of all sizes. By far our favourite part though are the vast grounds running to around 12 acres and allow for some amazing photo opportunities at any time of year. 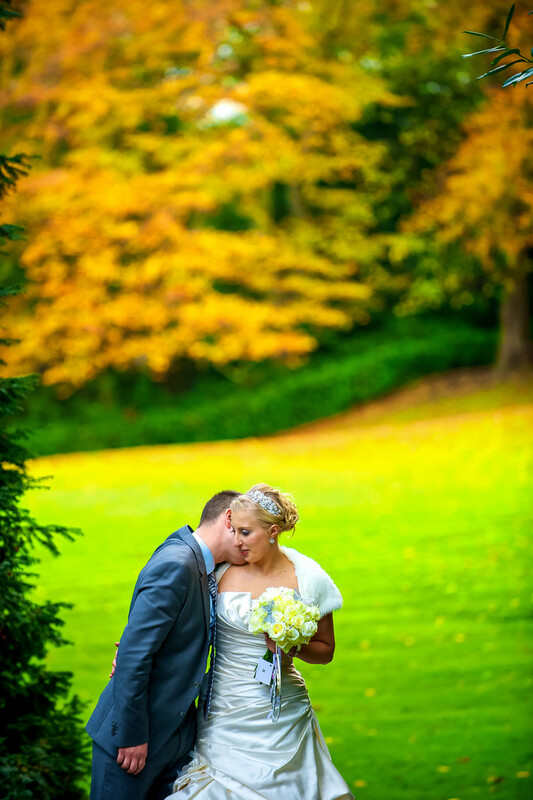 This wedding took place in early November and although it was chilly the gardens were as wonderful as ever with the autumn colours starting to develop in all their splendour. Autumn is one of my favourite times of year, summer is good but due probably to the stunning reds and oranges we get as the leaves start to turn from their summer colours to the autumn ones, they seem to give something extra to images.